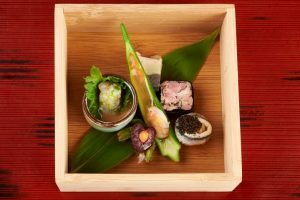 Kanazawa is a very exclusive Japanese restaurant in the Restelo area of Lisbon, specialising in Kaiseki gastronomy and run by Chef Paulo Morais, one of the first chefs in Portugal to specialise in Japanese food. The restaurant has a new tasting menu for July, using fruit and vegetables as a base to keep us fresh in the Summer heat. For starters, you can find a Chinese goiaba aromatic sake with rice cookie, and eel, pickled peach and baked peach purée toppings. You can continue the meal with fish sashimi, using a variety of different species such as tuna, greater amberjack and crevalle jack, wahoo (related to mackerel), and redfish. Then a dish called Takiawase, made from sweet potato, baby courgette and pork, presented with dashi stock in a goblet. Next comes the Naka-choko, a cooked vegetable terrine with seaweed gelatine and trout roe served in a somiso sauce. The high point of this tasting menu is the Hassun, comprised of six delicatessen served in a 24cm box; a fish tartar gaspacho, a cherry conserve with monkfish, sushi with anchovey conserve, a terrine of fish of 3 colours, okra stuffed with sea urchin and shrimp, and duck confite with foie gras, aromatic herbs and fried onion. The Hiyashi-bashi is then served – a cold soup of duck magret with Somen pasta, wakame seaweed with sesami, smoked duck and mushrooms. Then the Yakimono, grilled tiger shrimp with Japanese aubergine and lotus root. Then it is the time for sushi with several varieties comprising a true delicacy. Finally, dessert, the icing on the cake of this delicious menu – mango sorbet, Fundão cherry sorbet, and raspberry ice cream with chocolate and wasabi, melon, cantaloupe and watermelon. Santini continues to grow at the same rate it delights its fans with new tastes! 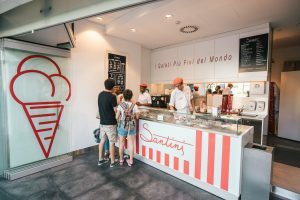 There are now two new ice cream shops in the Lisbon area, the first one located in LACS (Lisbon Art Center & Studios), which is actually in the town of Óbidos, and is a space dedicated to co-working, with art galleries and studios, workshops and much more. 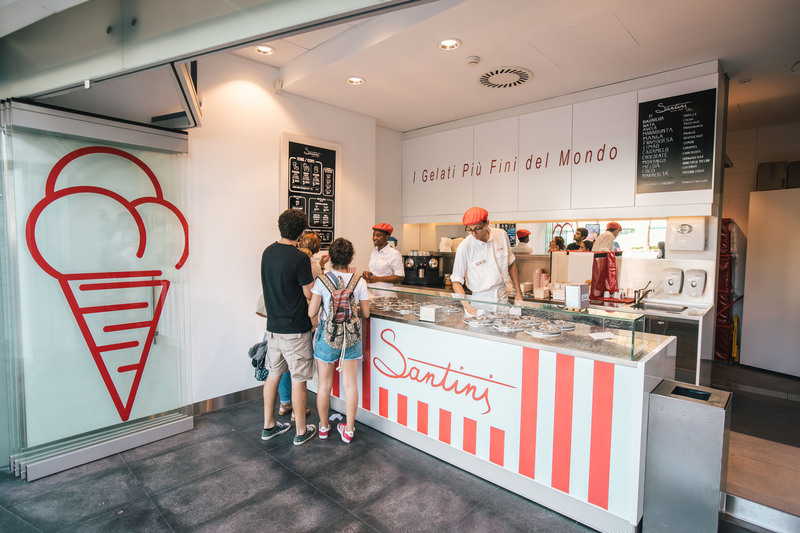 This is a street kiosk, which aims to maintain the traditional concept of the ice cream kiosk, and therefore will only sell the traditional Santini ice creams and not any other food product, and there will be no seating. There will be 10 to 12 different flavours which are rotated on a weekly basis. The other new Santini space is located in the EXPO area, on the Avenida Dom João II avenue, and has a similar look and feel to the one in Óbidos, with no seating. Here, however, customers can take delight in the traditional Santini cones, as well as cakes, chocolates, tarts, milkshakes and other tasty delights. 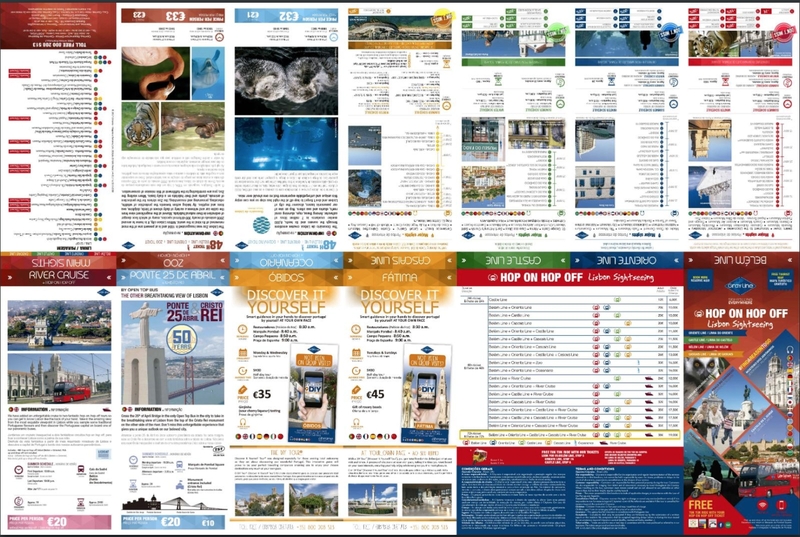 Includes: Tickets For The Hop On Hop Off Bus, Tickets For Torre De Belem And Jerónimos Monastery In Belém And 20% Discount On Everything You Want To Visit More In Lisbon! From each of these cruise terminal you can take the Hop on Hop off Bus to explore the city like Marques de Pombal, São Jorge Castle, Praça do Comércio and much more! 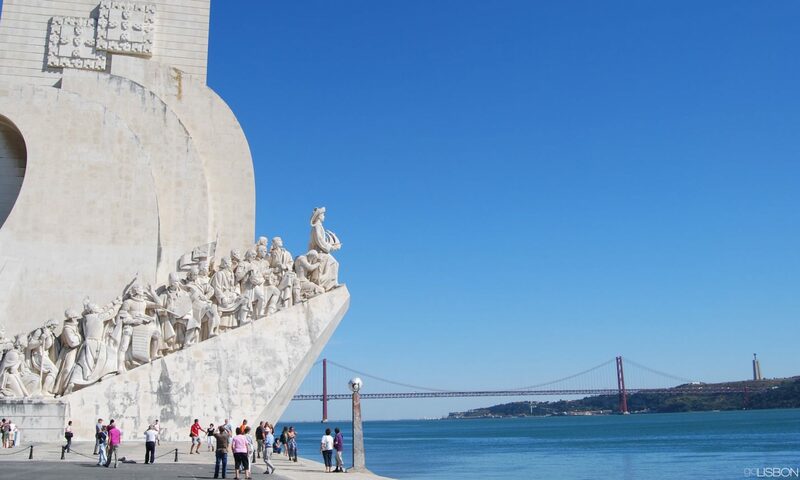 One of the stops is Belém where you can visit Torre de Belem and Jerónimos Monastery. 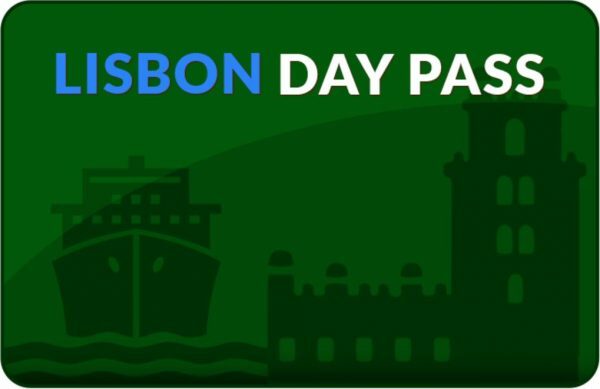 The Lisbon Day Pass is everything you need when you arrive at one of the Cruise Terminasl in Lisbon. Even better, you receive everything by email so that you don’t waste time picking it up when you arrive. How does it work when you get of the ship? You simply Hop on and explore the city. When you reach Belém you can get off and visit Torre de Belem and Jerónimos Monastery. 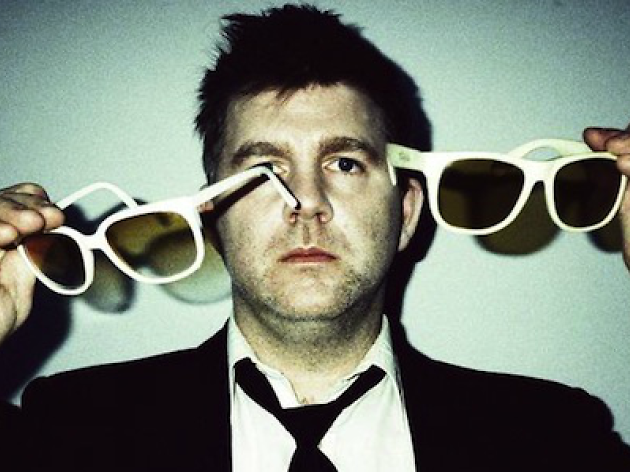 We made a reservation for you so you can enter both highlights anytime you want that day. 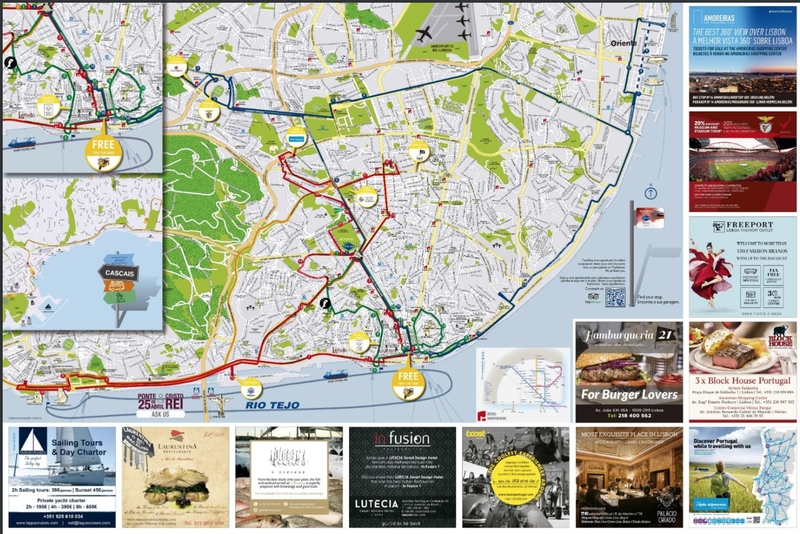 A perfect day out on your own in Lisbon!